Childrens Christmas Service - "From Everlasting to Everlasting"
Thank you for considering a Kremer childrens Christmas service for your church or school. Becuase this childrens Christmas service is fully reproducible, we cannot provide sample pages of the entire program. We have, however, included the opening introduction page, plus the first and last parts of each Christmas service. This should give you a good idea of the service structure. 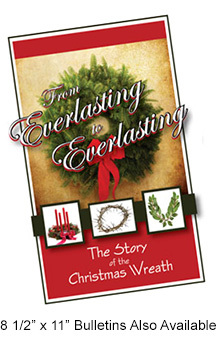 The story of the Christmas Wreath is the theme for this childrens Christmas service. Although we are used to hanging wreaths on our front doors and in our churches, many people don’t realize the wonderful significance that this decoration has to offer. This service considers several wreaths that all present something meaningful in our Christmas holiday. We begin with the Advent Wreath which provides a calendar to follow as we approach Christmas. The Wreath of Thorns reminds us of the sacrifice of Jesus on the cross. The Laurel Wreath was also mentioned in the Bible as a sign of victory in the Greek games. Today it symbolizes the crown of victory that will be ours one day. Finally we will look at the Christmas Wreath and the significance of its color and shape. SONGS – Four children’s songs with sheet music. Sheet music is included for two additional songs.